Attractively embraced by greenery, next to the sandy beach, Sol Nessebar Resort offers you the opportunity for unforgettable vacation. The hotels boast fascinating range of sports, excellent food, service-oriented environment and relaxing nature – all of these 2.5km away from Nessebar – a historical small sea town, included in the UNESCO World Heritage List. 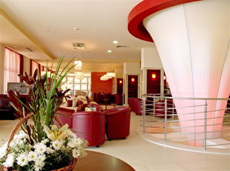 The 3-storey Rose SPA Center offers a vast array of amazing facilities within a complete health spa centre. It is equipped with aroma therapy area, Turkish bath area, spa capsule, Finnish & infrared sauna, contrastive showers and VIP area. Rose Spa center offers the ideal refuge where you will be able to harmonize mind, body and spirit. All guest rooms have private balconies with a relaxing view towards either the sea or the park. Every room is equipped with individual AC, direct dial telephone by the bed & in the bathroom, satellite TV & remote control, table & a sofa, writing desk, refrigerator, safe, luggage store, wardrobe, bath tube with a shower, hairdryer, full length & make up mirror. The resort is equipped with a brand new separate conference block. At disposal of the guests are 8 modern different sized conference halls with capacity up to 400 persons. The conference block is designed with stylish reception and coffee break areas. Modern conference equipment is provided, as well. Attractively embraced by greenery, next to the sandy beach, Sol Nessebar Resort offers you the opportunity for unforgettable vacation. The hotel has a wonderful view over the sea and the small village of Ravda which is only a few minutes walk from the hotel – approx. 1.8 km. The town of Nessebar – known as the “Pearl of the Black Sea” is 2.5 km north of the hotel and offers a unique combination of nature and history. Hotel Sol Nessebar Palace has 329 comfortably furnished rooms, family rooms with connecting doors, junior suites and 4 luxury suites. The attractively designed indoor and outdoor swimming pools with varying depths of water guarantee fun in the water. The animation team ensures that there is plenty of relaxed entertainment for adults and that the children are looked after in the Kids Club. In the Internet Club are several termnals which can be used for a small fee by web freaks, surfers and for e-mailing. The hotel also has a 4 bars, sun terrace close to the beach, volleyball and basketball playgrounds, tennis courts, darts, boccia, beach sports, fitness room with several pieces of apparatus, souvenir shop, hairdresser, pharmacy and photo shop. The SPA center Rose on three levels and offers next to beauty and massage treatments an indoor and outdoor pool, Jacuzzi, sauna, steam bath and gym. Rose Spa center offers the ideal refuge where you will be able to harmonize mind, body and spirit. individual AC, direct dial telephone by the bed & in the bathroom, satellite TV & remote control, table & a sofa, writing desk, refrigerator, safe, luggage store, wardrobe, bath tube with a shower, hairdryer, full length & make up mirror. 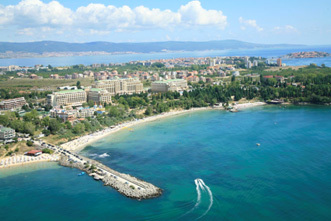 Hotel Sol Nessebar Bay has 283 comfortably furnished rooms, family rooms with connecting doors and 4 suites. All rooms are 4 star quality with superior equipment, balcony or terrace. The attractively designed indoor and outdoor swimming pools with varying depths of water guarantee fun in the water. The animation team ensures that there is plenty of relaxed entertainment for adults and that the children are looked after in the Kids Club. In the Internet Club are several terminals which can be used for a small fee by web freaks, surfers and for e-mailing. The hotel also has a 4 bars, sun terrace close to the beach, volleyball and basketball playgrounds, tennis courts, darts, boccia, beach sports, fitness room with several pieces of apparatus, souvenir shop, hairdresser, pharmacy and photo shop. The SPA center Rosa on three levels and offers next to beauty and massage treatments an indoor and outdoor pool, Jacuzzi, sauna, steam bath and gym. Rose Spa center offers the ideal refuge where you will be able to harmonize mind, body and spirit. Hotel Sol Nessebar Mare has 338 comfortably furnished rooms, family rooms with connecting doors and 4 suites. All rooms are 4 star quality with superior equipment, balcony or terrace.